Austrian ghetto poet; born March 8, 1825, at Prague. He studied philosophy and mathematics at the university in that city (1844-46), and then entered into business with his father, who was a wool-merchant. His first story, entitled "Gabriel," appeared over the initials "S. K." in 1852 in "Sippurim." Although full of exaggeration and improbabilities, the strong color and passionate movement of the narrative, and the rarity of Jewish stories at the time, caused it to be translated in the Jewish papers of many lands. An English translation, which appeared in the Tauchnitz series, made the author's name known in England and America; a second edition in German (2 vols.) was published at Jena in 1875. 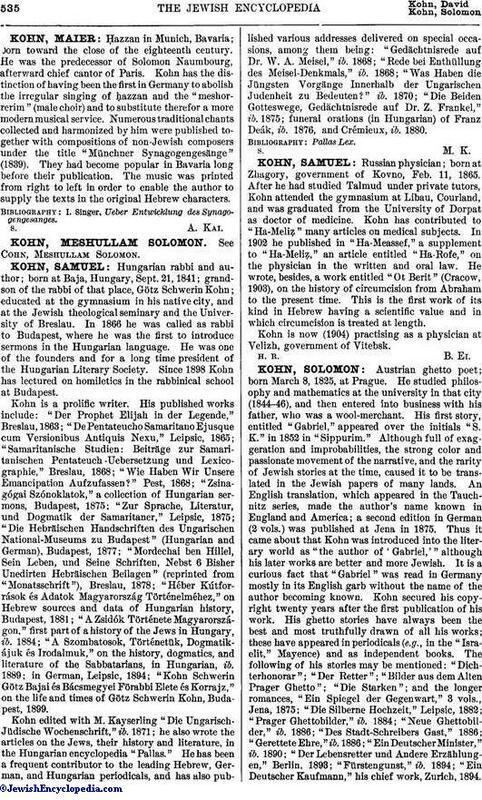 Thus it came about that Kohn was introduced into the literary world as "the author of 'Gabriel,'" although his later works are better and more Jewish. It is a curious fact that "Gabriel" was read in Germany mostly in its English garb without the name of the author becoming known. Kohn secured his copyright twenty years after the first publication of his work. His ghetto stories have always been the best and most truthfully drawn of all his works; these have appeared in periodicals (e.g., in the "Israelit," Mayence) and as independent books. The following of his stories may be mentioned: "Dichterhonorar"; "Der Retter"; "Bilder aus dem Alten Prager Ghetto"; "Die Starken"; and the longer romances, "Ein Spiegel der Gegenwart," 3 vols., Jena, 1875; "Die Silberne Hochzeit," Leipsic, 1882; "Prager Ghettobilder," ib. 1884; "Neue Ghettobilder," ib. 1886; "Des Stadt-Schreibers Gast," 1886; "Gerettete Ehre," ib. 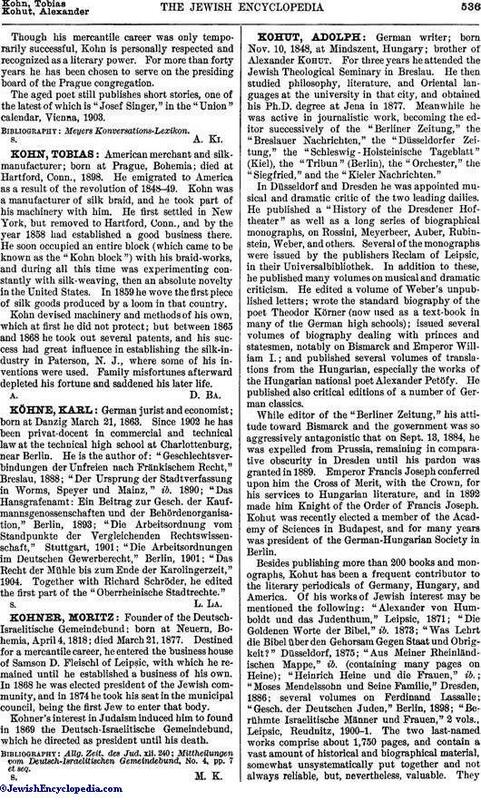 1886; "Ein Deutscher Minister," ib. 1890; "Der Lebensretter und Andere Erzählungen," Berlin, 1893; "Fürstengunst," ib. 1894; "Ein Deutscher Kaufmann," his chief work, Zurich, 1894. Though his mercantile career was only temporarily successful, Kohn is personally respected and recognized as a literary power. For more than forty years he has been chosen to serve on the presiding board of the Prague congregation. The aged poet still publishes short stories, one of the latest of which is "Josef Singer," in the "Union" calendar, Vienna, 1903.